ACE is a liquid biotic containing a consortia of natural beneficial microorganisms for use as an auxiliary soil and plant amendment. Soil microbial populations can be depleted due to repeated use of chemical fertilizers, decline in organic matter, excessive heat or cold, or several other reasons. ACE is designed to restore a population of beneficial microorganisms to soil to improve soil health. When soil is highly populated with beneficial microorganisms, disease pressures are reduced. Beneficial bacteria aids in the suppression of soil diseases. Breaks down organic matter into a form, such as humus, to feed indispensable microorganisms. Beneficial bacteria and fungi gather free Nitrogen and convert it to proteins as they multiply. Microbial colonies consume the converted protein, releasing ammonium that is converted to Nitrates; the result being a steady release of Nitrogen, Phosphorus, and other essential nutrients. Microorganisms in the root zone produce hormones and chemical signals vital to stimulating plant growth and development. Bacteria glues soil and clay particles together in an aggregated and breathable structure, while the fungi grows through and physically binds the structure, preventing collapse. 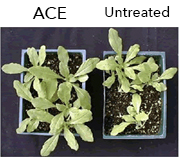 Effect of Ace on Petunia stand grown in Pythium and Rhizoctonia infested soil-less media 6 weeks after seeding. Healthy stand of Zinna grown in Pythium and Rhizoctonia infested soil-less media 14 days after seeding. 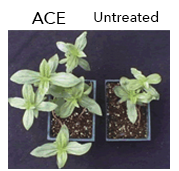 Effect of Ace on Zinnia stand grown in Pythium and Rhizoctonia infested soil-less media 6 weeks after seeding. Effect of Ace on Geranium stand grown in Pythium and Rhizoctonia infested soil-less media 6 weeks after seeding.